Inscription in cliff face next to the entrance of the "Yeren Cave". The inscription reads "Ye Ren Dong" ("Wild Man Cave"). 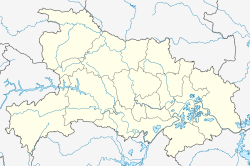 Fang County or Fangxian (simplified Chinese: 房县; traditional Chinese: 房縣; pinyin: Fáng Xiàn) is a county of northwestern Hubei province, People's Republic of China. It is under the administration of Shiyan City.